As the new GI Bill rolls out, the University of Arizona (with ~400 veterans already on its campus) is gearing up to welcome even more onto its rolls. Their Teaching Center is "developing a transition curriculum for veterans and is training faculty on how to teach them ... [and] has begun to offer veterans classes on resilience and stress management...designed to improve memory, strengthen problem-solving skills and build a social support network." Vets attending the University of Arizona will also be able to take part in their Disability Resource Center's federal Participatory Action Research Project , which will "study veterans reintegration and transition from the military into college." UA is hosting a celebration for veterans and their sponsors on Thursday, Oct. 9, from 4-6 p.m. in the Student Union Memorial Center. This past Wednesday, presidential candidate Sen. Barack Obama met with Matt Kuntz, the stepbrother of Montana National Guard and Iraq vet Chris Dana. Dana "took his life in March 2007, less than two years after returning from a tour in Iraq. His family believes he was a victim of post traumatic stress disorder, brought on by his combat experience." Since then, his stepbrother has been among those pushing Montana to implement "more than a dozen changes in its policies in an effort to address PTSD and traumatic brain injuries in returning soldiers. A key initiative in the new plan is to screen all returning soldiers every six months for two years after their tour of duty." Obama has promised that he would "expand Montana's pilot program to assess the mental health of combat vets nationwide." Last week, the Minneapolis-St. Paul Star Tribune's Gail Rosenblum delivered an important piece on "the private scars of war," intimately introducing us to one family dealing with the most personal after-effects of war. With ~56 percent of today's troops being married, "the U.S. Defense and Veteran's Affairs departments are acknowledging that the physical and emotional scars that troops carry home present a sensitive challenge: sexual intimacy and body-image issues that most couples' therapists are ill-prepared to treat. ...The number of people returning with disabilities, is an 'enormous problem ... an astonishing problem.' ...Combined with the fact that returning vets are usually older and partnered, this is having a devastating effect on relationships." Beginning last month, in the days immediately before Independence Day, a riveting series called "In Their Boots" laced up and hit the Internet for the first time. It offers the nation's 99.5% of non-serving civilians an intimate portrait into the struggles and successes of our military families today. Ever since its first webcast, host Jan Bender (an Iraq vet and Marine himself) and the Brave New Foundation team have been broadcasting a new live and interactive episode every Wednesday night at 4pm Pacific/7pm Eastern. Each week, viewers are invited to listen to the stories of Iraq and Afghanistan service and family members, learn about the groups and organizations that are helping them, and then called to help in some way as well. This week's episode ("War Scar"), airing on August 27, 2008, introduces us to Jerry Cortinas, "a Green Beret in the U.S. Army Special Forces from 1997 to 2004. The focused and challenging work of a Green Beret was what he knew and what he loved. While operating a rocket propelled grenade in Afghanistan in December 2002, the device malfunctioned and exploded, taking his left forearm and hand. Jerry could no longer do his job. He felt like an outsider in his own hometown." Jerry's wife, Celina, paints a portrait of a strong (yet still made of flesh and blood and feelings and prides and hurts like the rest of us) Army wife, now faced with "the challenge of helping her husband adapt to civilian life and supporting him as he returned to his role as husband and father" to their two kids. The Department of Veterans Affairs (VA) gives notice under Public Law 92–463 (Federal Advisory Committee Act) that the Advisory Committee on OIF/OEF Veterans and Families will conduct a meeting and a site visit in the Palo Alto, California area on September 16–18, 2008. Committee activities will include tours and briefings at various VA facilities. The purpose of the Committee is to advise the Secretary of Veterans Affairs on the full spectrum of health care, benefits delivery and related family support issues that confront service members during their transition from active duty to veteran status and during their post-service years. The Committee will focus on the concerns of all men and women with active military service in Operation Iraqi Freedom and/or Operation Enduring Freedom, but will pay particular attention to severely disabled veterans and their families. The agenda for the September 16–18 meeting will include briefings on recent site visits, discussions on proposed recommendations to the Department of Veterans Affairs (VA), and tours of the VA Medical Center. The Committee will discuss its findings and observations based on previous Committee meetings, site visits, written reports, and personal experiences. The brain mechanism that turns off traumatic feelings associated with bad memories has been identified by researchers at the University of California, Irvine, who said their finding may lead to the development of new drugs to treat panic disorders. When a person suffers a traumatic experience, environmental cues often become associated with the bad experience. Subsequent exposure to the same cues can cause fear or even panic attacks, according to study author Rainer Reinscheid, an associate professor of pharmacology and pharmaceutical sciences. The UCI team, along with colleagues from the University of Muenster in Germany, found that a protein called neuropeptide S (NPS) eliminates traumatic responses to bad memories by working on a group of neurons inside the amygdala, the brain region where negative memories are stored. The Department of Veterans Affairs uses it in their Hepatitis C treatment program. Fort Bliss' Warrior Resilience program -- the same one Army Chief of Staff Gen. George Casey believes should be replicated throughout the military -- uses it as one tool to help soldiers strengthen and recover following combat. Military OneSource's Health Library says it can increase wellness and "treat diseases of all types." And it's the reason given by New Zealand's champ cyclist Hayden Roulston for bouncing back from a serious heart condition to claim both Olympic silver and bronze medals this past week in Beijing. What is it? 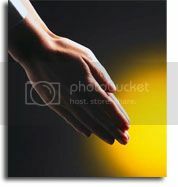 Reiki [pronounced "Ray-Key"] energy healing. While I've heard of it in the past (in fact, I have a sister who is a Reiki Master and had used the touch therapy in her past massage therapy practice), it seems to be bubbling up to the mainstream surface more and more these days. That the military and VA are incorporating it, is another positive sign that mountains can be moved even in mammoth bureaucracies -- as long as you believe it can be so (and add a little action into the mix to help it along). ABC World News said a new report from Oklahoma Sen. Tom Coburn (R) has found that a "growing number" of Federal workers are not showing up for their jobs, a situation which Coburn "says costs $7 billion to $10 billion in lost productivity every year." How do these employees "get away with it? Coburn blames layers of bureaucracy and inefficiencies, which have allowed the numbers to grow." But the "union which represents many federal employees blames the Bush Administration." While not mentioned above, the ABC report reveals that the Dept. of Veterans Affairs has the most truant workers of all federal agencies. While most individual VA employees do incredibly trying and important work for our military families, that their peers rate highest for "no shows" (simply not coming in for days, weeks and even months at at time while still being paid) is yet another indication of the mammoth failure of our federal systems. Disturbing news as a taxpayer and also as someone who believes the VA needs to do better than it currently is. We deserve better from our government. “More often than not, the veterans I have spoken to all say they know somebody who has attempted suicide,” says Portland State University professor and suicide researcher Mark Kaplan. • In 2005, the last year for which complete Oregon data has been compiled, 19 Oregon soldiers died in combat in Iraq and Afghanistan. That same year, 153 Oregon veterans of all ages, serving in various wars, committed suicide. • The rate of suicide among Oregon men who are veterans is more than double that of Oregon men in general — 46 suicides out of every 100,000 compared to 22 out of 100,000 — according to the Oregon Department of Human Services Center for Health Statistics. • Nearly one in three Oregon suicides, according to Kaplan, is a veteran. Iraq and Afghanistan Veterans of America relaunches an updated version of their veterans' educational benefits website, GIBill2008.org that includes an online calculator and details on the new program. Partially going into effect earlier this month with a 20 percent benefit increase, the full package of improvements rolls out in August 2009. IAVA was among the groups who pushed Washington hard to give today's returning veterans the same college benefit -- full tuition, book allowance and monthly living stipend -- as their WWII counterparts received. Meanwhile, the Labor Department is rolling out its new website, America's Heroes at Work, to help employees "better understand the mental health issues veterans may face" and, hopefully, help to reduce the stigma of hiring those returning with PTSD, TBI and other injuries. "One message of the initiative is that many of the veterans' symptoms are either manageable or will go away with time. Another message is that small changes, such as scheduled rest breaks for a veteran with a traumatic brain injury, can make a big difference." A toll-free number, 800-526-7234, has also been set up for employee questions. In operation for a year now, the new VA suicide prevention hotline, 1-800-273-TALK (8255), recently reported that it's received more than 55,000 calls, about 22,000 saying they were veterans. CBS News reports that the majority of the most recent calls "have come from the mid to south central part of the country[:]" Texas, Tennessee, Illinois and Florida. "Calls to the VA’s hotline more than doubled this calendar year going from a total of about 21,000 in January to more than 55,000 by the end of June, averaging about 250 calls a day." Ace USA Today veterans' issue reporter Gregg Zoroya writes an unsettling piece on 20 soldiers who told of "mold in the barracks, delays in processing medical cases and morale in the Warrior Transition Unit (WTU) for wounded and injured outpatients at Fort Sill." Ironically, these WTU's were created to address these very same issues of moldy housing units and substandard aftercare at Walter Reed Army Medical Center. But Fort Sill appears to rely on a heavy-handed approach with their ailing soldiers, some heavily medicated and variably disabled due to their injuries, issuing Article 15 punishments "like they were candy." File this one under "NOT the way to support our military families:" The Charleston Gazette's Andrew Clevenger reports on a lawsuit filed by the parents of an "Iraq war veteran who died in his sleep in February while recovering from post-traumatic stress disorder" against AIG, a private insurance company. The suit revolves around AIG's refusal to pay out on the $50,000 life insurance policy their son, a Marine combat engineer who disarmed IEDs and patrolled the Iraq-Syria border while deployed overseas, purchased after returning home. Wishing to ease any further stress and financial burden on his parents in the event of his own death, he bought the policy after his brother -- serving with the Army in Afghanistan -- died in an RPG attack. A well-written profile piece by Gabe Nelson for the Toledo Blade -- filled with both heart and a lot of local and national data -- introduces us to Maj. Dorian LeBeau, a clinical therapist working at the Toledo Vet Center as they begin an expanded PTSD care program. LeBeau, an "Army mortuary affairs officer based at Camp Doha, Kuwait" recovering remains of fallen U.S. soldiers during past Iraq and Afghanistan deployments, says, "My main focus since I’ve returned home is to help other individuals like myself to ensure they’re getting the things they need, from someone who understands what they’re going through." Maj. LeBeau: You rock, sir. The pattern of health problems reported by 1,114 women surveyed in 2006 and 2007 is similar to many symptoms of Gulf War Syndrome, the controversial condition reported by veterans of the 1991 Persian Gulf War. "It is possible that some unknown environmental factor is the cause of current health problems and of Gulf War Syndrome," said U-M researcher Penny Pierce. "But it is also possible that these symptoms result from the stress of military deployment, especially prolonged and multiple deployments." An Iraq infantryman named Zero offers a compelling introduction to this post, which brings together a number of art programs and exhibits taking place on television and in galleries and statehouses and theaters across the country this summer and fall. The one common denominator: the fusion of expression through art and the experience of war. Arriving today in the Journal of the American Medical Association, the article Alcohol Use and Alcohol-Related Problems Before and After Military Combat Deployment delivers the results of "one of the first major studies to emerge from the Pentagon's landmark 'Millennium' study, launched in 2001." According to Carla K. Johnson of AP, "researchers analyzed data from nearly 80,000 military personnel, including more than 11,000 who were sent to Iraq and Afghanistan," and found that 26 percent (>600 of 2,400) of troops who reported no binge drinking prior to the study "developed the problem after deployment and combat exposure." Guard and Reserve troops had a 60 percent higher rate of developing "[n]ew patterns of regular heavy drinking and alcohol problems." In the July/August 2008 issue of Psychosomatic Medicine, A Prospective Study of PTSD and Early-Age Heart Disease Mortality Among Vietnam Veterans reports that having PTSD "significantly raises the risk of premature death from heart disease...[being] roughly twice as likely to die from heart disease during follow up as veterans without PTSD." Reuters' Megan Rauscher quotes the study's chief researcher, Dr. Joseph Boscarino, saying that the work "confirms that PTSD is a major cause of heart disease." He said the effect PTSD has on the body is the same as "smoking two to three packs of cigarettes per day for more than 20 years." A five-year Emory University study sponsored by the National Institute of Mental Health is looking at an antibiotic, "a 50-year-old tuberculosis drug called D-cycloserine, or DCS," as a possible treatment for anxiety and PTSD. Eric Hagerman of Popular Science reports that "veterans with PTSD take the drug or a placebo, don a virtual-reality helmet, and re-create their worst nightmares...[while a] therapist guides them safely through the traumatic memory." The drug, which has shown promise in treating obsessive-compulsive disorder and phobias like fear of heights, works on the brain's amygdala by allowing the traumatic memory to be "reshaped" or lessened. Clinical trials are ongoing. You'll find your spring again. Back in May, as has been the case since 1984 on each Friday before Mother's Day, we celebrated what's known as Military Spouse Appreciation Day. Spouse Buzz, a place where military spouses can connect with one another, hosted guest blogger Lieutenant General William Caldwell, Commanding General, U.S. Army Combined Arms Center and Ft. Leavenworth. We’ve watched you nurse your wounded warriors back to health in military hospitals. You’re there, still full of hope, when Troopers with head injuries don’t recognize their family. You encourage them. You decorate their rooms. You read their favorite books to them. You are the first to notice when they can squeeze your hand again for the first time. All military spouses know why their loved ones serve, and they share in their hardship and sacrifice and ask for little in return. It is humbling to those of us who wear the uniform to know that our best friends, our spouses, are serving along side us. Those of us in uniform serve because we love our Nation; our spouses do it for love of us. Our service men and women could not continue in this profession without your help, and for that we are eternally grateful…and so is our Nation. AP's Scott Lindlaw reports that even troops shielded and far from the Iraqi combat zone are having similar psychological reactions as those deployed overseas. "The Air National Guardsmen who operate Predator drones over Iraq via remote control, launching missile attacks from the safety of Southern California, 7,000 miles away...[are citing stressors from] the exhaustion that comes with the shift work of this 24-7 assignment; the classified nature of the job that demands silence at the breakfast table; and the images transmitted via video." Illinois has been on the cutting edge when it comes to finding local solutions to problems caused by inadequate federal veterans' benefits systems. Even before the new GI Bill became law, Illinois picked up the college tuition tab for its vets. It offers a PTSD screening program and 24-hour hotline for returning veterans via its Warrior Assistance Program. And now, Gov. Rod Blagojevich is set to use his amendatory veto to exempt thousands of wounded Illinois veterans from having to pay property taxes. The House and Senate must approve it before it can become law next January. Healing Combat Trauma blog has some interesting insights and strong suggestions on the problems some women are facing in the military in "Twice Betrayed: Women Veterans and Military Sexual Trauma." 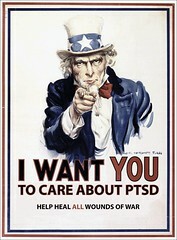 Want to learn more about PTSD? Sage Publications is offering free access to its large collection of psychology, counseling, and psychiatry journals now through the end of September, 2008. Two more Simon's Cat installments in extended. Can Local Anesthesia Knock Out Anxiety of PTSD? William Hageman of the Chicago Tribune reports today on an area doctor using a novel approach to treating the anxiety that surfaces in many PTSD sufferers. Estimates of how many veterans suffer from PTSD range as high as 50 percent. What's not disputed is that most of them are undiagnosed. Dr. Eugene Lipov refers to the growing problem as "the reverse surge." Lipov is the president and medical director of Advanced Pain Centers, with offices in Hoffman Estates and Westmont. He believes he has found a way to combat the feelings that come with PTSD through a seemingly simple injection that calms the section of the brain that becomes overactive in PTSD patients. The treatment is called a stellate ganglion block [more info: general | clinical], an injection of the local anesthetic bupivacaine around a group of nerves in the neck. "The medication we're using is the same numbing medication that has been used for decades for pregnant women during labor and delivery," explains Dr. Jay Joshi, director of research at Advanced Pain Centers. But using it against PTSD is a new idea. Lipov made another connection between the medication and the body's reaction. "I found that one part of the brain that works on hot flashes and PTSD is the same ... the insular cortex," he explains. The injection, he says, "reboots" the insular cortex. "It resets the nerve system the way God built it," he says. View the procedure, and learn of the experience of the first Iraq veteran to receive this new treatment in extended. This is a long, long delayed post on an extraordinary individual, doing heartfelt and much-needed work to bring the public's attention to combat PTSD. My greatest appreciation for her and her work, and apologies this took so long to get online. Beginning tomorrow in Albuquerque, New Mexico, attendees of the 11th Annual Force Health Protection Conference (free conference to military and civilian alike) will be in for a great treat. Alison Lighthall, founder of Hand2Hand Contact, presents "10 Things You Can Do If You Only Have 10 Minutes: Healing Interventions That Can Be Done With Veterans Anytime, Anywhere." Growing up, my family was an Olympics-loving family. Every four years we'd watch spell-bound as the world came together to compete and show their stuff. My parents, being political refugees from Hungary following the 1956 Revolution against the mighty Soviet Union, of course would root mightily against the Red giant. Remember the miracle 1980 USA hockey team? That USSR defeat not only brought our house down, it was celebrated by nearly the whole country back then. These days, so much has changed politically, but our world still continues to harbor an "us against them" mentality, one bred on the feeling that we don't share bonds with others that don't look like us or talk like us or salute the same flag. This adversary becomes sports(wo)man-like at the Olympics. But, with China being the host country this year, we've seen more tumult and protest leading up to this years' games than we've witnessed in the past few gatherings. What to do? One documentarian has chosen to deal with the situation by aiming his focus on fostering peace (rather than rallying against China; btw, the Chinese characters above spell "peace"). Today, as the Games begin, we're all invited to join in with him to help produce an interesting art project, World Wide Moment. Congress and the Pentagon are in the midst of funding a record $300 million military PTSD/TBI research push this summer. With approximately 1.4 million Americans diagnosed with TBI annually, civilians will benefit from the groundbreaking drive, too. "The Pentagon also will target new ways of delivering therapy to PTSD victims living in remote areas of the USA and reducing the stigma that can keep victims from seeking help." Since last November, Military Spouses for Change has been on a mission to bring our presidential candidates together for a Fort Hood, Texas, debate and discussion of issues important to military families. Founder Carissa Picard has so far succeeded in securing a date (August 11); getting CBS to agree to broadcast the event live; and received candidate John McCain's OK. As for Barack Obama? He says that due to scheduling difficulties he can't be there. Maybe something will change by then and the conversation will get underway. If not, a tip of the hat to MSC for their effort. Don't forget Tuesday's LA Times online chat on the sleeping difficulties of combat veterans diagnosed with PTSD. The chat begins at 9:00 am Eastern/noon Pacific, but the accompanying article is already online. Some stats: "About 36% of Army troops who have been back from Iraq for a year said they struggled nearly every day with feeling tired. About 34% said they had difficulty falling asleep, staying asleep or sleeping too much nearly every day... About 70% of veterans being treated for [PTSD] have sleep problems." And if you're looking for more stats on the mental health and well being of our OEF/OIF troops and veterans, "The military's invisible wounds" by David Isenberg would be well worth a read. Google has just launched a new online product called Knol (short for 'knowledge'), some say to compete with the ever popular Wikipedia. While there are some similarities, there are notable differences as well -- chief among them the ability to produce and control your own page of original content. I've just created my knol on Combat PTSD (beefing it up with additional sections in the weeks ahead), and invite you to head over to read, rate and/or review it. Since you're online right now and have found your way to this blog, perhaps via a search engine or another link, you're most likely someone that's pretty comfortable with using the Internet. It's a powerful source of information. One of the Web's greatest strengths is that everything is right at your fingertips, all easily accessed from the comfort of home or work or maybe even a library or Internet cafe. Heck, just about anywhere you are if you're wireless these days. In addition to the usual free-form tapping into digital knowledge, there are also more structured ways of learning on the Internet, too. I've poked around a bit and found three cyber classes on PTSD that I'm happy to share in extended. Please note: The first two courses are "perishable," i.e., they start soon. If you're interested, sign up now rather than later. So begins director Jennifer Lee's 2008 Australian documentary, Casualties of War, now available on YouTube (and at triple j tv). "CASUALTIES OF WAR tells the story of Leigh, a Special Forces soldier who served with the Australian Army in East Timor. Leigh believes that the hardest part of going to war is coming home. A year after Leigh returned from East Timor he reached breaking point and left the army. It is only now, 4 years later, he feels able to speak out about the realities of being a soldier." The U.S. House of Representatives passed [409-4] the 2009 Military Construction and Veterans Affairs Appropriations bill that would eclipse President Bush's budgetary request by $3.4 billion and gives the green light on construction of a new replacement VA hospital in Louisville, Ky. It still has to pass the Senate -- and the president's veto pen -- before the full $118 billion can be doled out. The House also rushed through another eight veterans' benefits bills, including the unanimous approval of the Disability Claims Modernization Act, which would speed up claims processing for those veterans recovering from disabilities clearly (i.e., serious physical combat wounds) connected to their military service. Senators Charles Schumer [D-NY] and Hillary Clinton [D-NY] have agreed to introduce Rep. John Hall's [D-NY] legislation it in the Senate in the "hopes of improving the delivery of compensation to veterans, their families and survivors." Meanwhile, the Senate passed the Veterans Compensation Cost of Living Adjustment Act, which would provide the nation's 3 million veterans drawing service-connected disability benefits the same cost-of-living increases Social Security recipients receive today. The legislation will have to pass the Senate and be signed into law before it can go into effect on December 1, 2008. The new GI Bill, dubbed "a GI Bill for the 21st century," officially went into effect on Friday, more than doubling the educational benefit each Afghanistan and Iraq veteran earns to $90,000 from $40,000. "The Post-9/11 GI Bill will cover full tuition at the most expensive public college in a veteran's home state, grant up to $1,000 for books and supplies, and provide a monthly living stipend." I've been a runner for years (more like "jogging" the way I do it :o) and have always leaned on a number of yoga and qigong moves for my warm-up/cool-down. The spinal twist is one of my favorites as are mountain pose and warrior pose. This summer, however, I've picked up my yoga and qigong practices a notch and have found my daily 30 minute routines not only give my body a great workout, they help to clear the mind of stress with every stretch and inhalation. In extended, you'll find a few more paragraphs from the Yoga Journal piece on Van der Kolk's efforts in this field, along with a look at recent studies and articles on the subject. The Inner Resources Center of the Pacific Graduate School of Psychology is conducting a study about the effects of military participation in Iraq and Afghanistan. In the light of the current dialogue concerning the difficulties that veterans have in finding effective mental health treatment, this study is an opportunity for veterans to experience and evaluate novel treatment methods for coping with the difficulties of serving in the military and coming back home. Meditation or Education Participants will be compensated for their time. Is it possible to post the information about our study on your website? Find all the information on the study below the fold. Mitch Hood, 25, spent two tours in Iraq with the Marines. Now, like many other veterans, he faces a new enemy: sleep. Hood has nightmares nearly every night, many like the one above, laced with the fear he felt when he was in Iraq. Most nights, he battles his own body's need to sleep, opting to stay awake so he doesn't fall into nightmares. Hood knows he is not the only one with these problems. Sleep and wakefulness issues are the most common health problems described by recently returned soldiers, researchers at Walter Reed Army Medical Center found in a study published last year. A Times reporter and videographer stayed up all night with the former Marine and his fiancee to witness his struggles. The print story will appear in Tuesday's newspaper. A video of the vigil, plus interviews with Hood and other veterans, accompany the story on the Web. Mark your calendars and set your bookmarks -- the chat happens right here Aug. 5 at noon Pacific time.